It may come as a surprise to some that the semi-divine culture and profound inner meaning of China’s 5,000-year history is reflected in many of today’s art forms, especially music and dance. In Chinese culture, dance is a way to express not only personal emotions and feelings but also the character of the nation. The choreographer, through demonstrations by the dancers, expresses his or her realm of thinking. That’s why the combination of forms and movements, also called body techniques, and the dancer’s inner world all affect the inner meaning transmitted. Chinese dance is also called classical Chinese dance. Its origin can be traced back to ancient court dances or folk dances from thousands of years ago. Starting from the Zhou Dynasty which lasted from 1122 to 256 BC, through successive dynasties up to the Five Dynasties Period from 907 to 960 AD, the royal court had an agency in charge of music and dance, and musicians and dancers were centrally trained. In addition, the agency also systematically organized, researched, refined, and further developed folk dances, religious dances, and dances originated in other countries. This was how court dances originated. Since court dances were mostly created by artists based on Chinese folk dances, they were rich and refined as a traditional Chinese art form. The Tang Dynasty (618 – 907AD) was a peak period for traditional Chinese dance. However, the wars during the Five Dynasties period disturbed social order so much that many famous dances were lost or became incomplete. After the Song Dynasty (960 – 1279 AD), folk opera replaced pure dance as a flourishing art form. 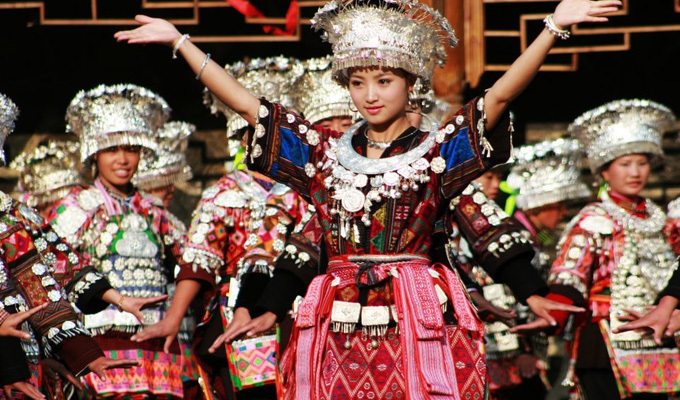 Of course, the formation and development of folk opera also inevitably inherited and mixed in many previous art forms; dances and music from the Sui (581 – 618 AD) and Tang dynasties became an important component of folk opera. Although the incorporation of folk dances into folk opera was based on the need of the opera, it indeed retained an extremely rich collection of traditional arts. Many relics from ancient times bore images of dancers from various dynasties. These relics showed a clear connection between opera and dance. That is why although opera replaced dance and music as the prevalent performance art form, old operas still carried the characteristics of ancient Chinese dances. In recent years, as qigong gained popularity in China, movements in martial arts became an important source for further developing classic Chinese dance. For example, Tanzigong (literally meaning “mat movements”) was a part of Chinese martial arts. When classic dance choreographers borrowed elements from Tanzigong , they incorporated jumps, turns and summersaults into the dance. As traditional gems such as Taiji and sword moves were used in dance, they greatly enriched the repertoire of classic dance. In addition, ancient murals, grottos, cave drawings, sculptures, and dance literature have played an important role in continuing and researching classic dance. Prior to the May 4 Movement in 1919, classical Chinese dance were mostly passed down among the common people. After 1919, some artists believed that they had a responsibility to systematically document Chinese dance—that was the beginning of the formal teaching of classical Chinese dance. To develop and rejuvenate folk dance, the artists learned from dance elements of folk operas, and incorporated techniques in ballet training and Chinese martial art forms, creating a unique and special system of classical Chinese dance. The long and varied history of Chinese dance gave it diversity of movement, refinement of form, and richness of character. Since Chinese dance was developed through a number of dynasties and social environments, it has been able to depict multiple nationalities, social classes, time periods, and personalities. Elements of any ethnic background can be included and interpreted by Chinese dance, and fully demonstrated. This is why in the future, classical Chinese dance will have a large capacity of development and growth. The marked success of the 2007 NTDTV Chinese New Year Spectacular, which focused on classical Chinese dance, showed that Chinese dance is positioned to become a mainstream performance art form on the global stage. Next articleWhy Is it Important to Do Volunteer Work?